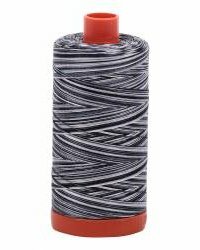 Aurifil Variegated 50wt Cotton Thread is a 2-ply Mako Cotton Thread. A higher thread weight indicates a finer (thinner) thread. Finer thread will emphasize your fabric choices and quilt design. Suitable for Hand Applique, Hand Piecing, Lace, Machine Applique, Machine Piecing, Machine Embroidery, but most popular for Machine and Longarm Quilting. The most popular weight of Aurifil Thread is their fine 50 weight 2-ply cotton thread. If you want to show off your stitches you will want to try Aurifil 28wt or 40wt Thread instead. Aurifil has recently established official color names. Click here for list of old and new names.